Stay indoors on the 13th of April - if you happen to be in Thailand. Or step out if you love water... and getting wet! For it's a given that you won't escape the water pistols, the water balloons and buckets of water as the Thais celebrate Songkran, the Thai New Year. 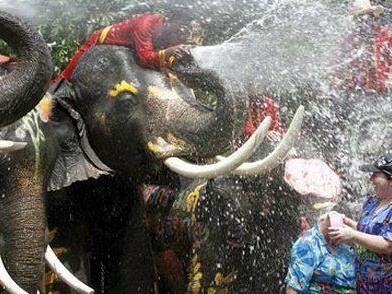 Songkran festival is also known as Thailand water festival, celebrated with fervor and zeal in Thailand’s cities. 'Songkran' (from the Sanskrit word Sankranti, signifying the sun's shift from one zodiac to another) heralds the beginning of the solar year and is the most important festival for the people of Thailand. The festival is celebrated over three days, 'Mahasongkran' on the 13th of April marks the end of the old year, Wan Nao (14th April) is the day after and April 15 is Wan Thaloeng Sok when the New Year begins. 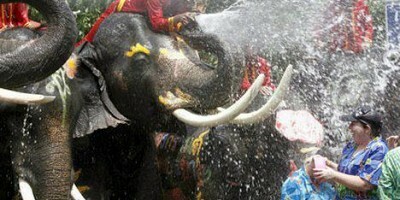 Sonkgran is akin to the Indian festival of Holi and the Chinese festival of Ching Ming. Though it is celebrated all over Thailand with great gusto and enthusiam, it is in Chiang Mai that the Thais hold the very important ritual of bathing the Buddha and people from all over come to be witness to this event. On Thailand New Year's Day, Thais pray to the Buddha, clean temples and houses, offer alms to the monks and sprinkle scented water on elders as a mark of respect. The pouring of water is symbolic of the cleansing of the spirit, mind and body. The water is also supposed to wash away bad luck - so consider yourself blessed if you get drenched! Happily, Songkran falls during the hottest time of the year and the water is a welcome relief.